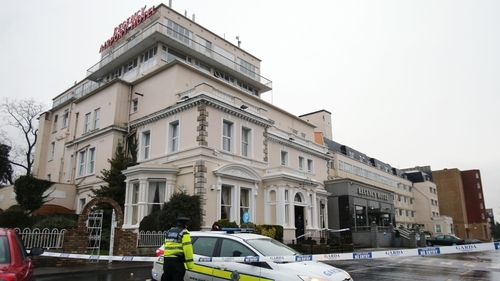 An accountant at the Regency Hotel on the day David Byrne was shot dead two years ago has told the Special Criminal Court that she saw a man dressed as a woman and thought it was a prank. David Byrne, 34, was shot six times at a boxing weigh-in at the hotel on 5 February 2016. Accountant Margaret Christy said she thought it was a prank until she saw the two people fire shots from black handguns. She said she knew it was a man dressed as a woman and laughed as she told people. When the shooting started however, she said people started throwing bottles at the couple. Witness Paul Spencer said the owner of the MGM Gym Daniel Kinahan was there that day and that people believed the men dressed in tactical outfits with guns were gardaí until they saw one of them shoot someone. He also said these men dressed as police tilted their heads and looked at people on the ground, obviously looking for someone. He also said the man in the blonde wig looked around the room shouting "he's not f***ing here" and "I can't see him, I can't see him, he's not f***ing here". The former president of the Boxing Union of Ireland Mel Krystle also testified to hearing shots, seeing the wounded and cancelling the boxing events after the murder. Yesterday, the court was told that the man in the flat cap was Kevin Murray who has since passed away, while two gardaí at Mountjoy recognised the man in the wig as Patrick Hutch. The prosecution claims Patrick Hutch of Champions Avenue in Dublin was the man dressed as a woman on the 5 February 2016. The 25-year-old man denies charges of murder and related firearms offences. The trial continues at the Special Criminal Court on Monday.